Citibank signed a billion dollar long-term lease renewal at 388-390 Greenwich Street. Otherwise, office rent was relatively quiet last month with rents unchanged. Retail rents continue to escalate in the prime markets. Retailers are now considering alternate locations where they can make profits with lower rents. As retail rents continue their skyward climb along Fifth Avenue north of 49th Street, shop owners are becoming increasingly willing to pursue space in far-flung areas. Midtown office leasing continues to improve, while Midtown South slowly loosens. Vacancy in Midtown fell to 10.8 percent, down from 11.1 percent in the same month last year. Average asking rents were $72 per square foot in Midtown, up 11.6 percent from $64.50 in the same period last year. 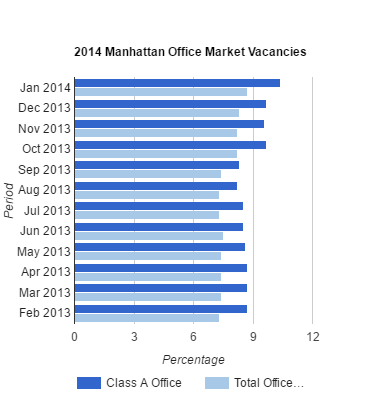 Downtown Manhattan had increased rate of sales and leasing of office properties during the third quarter of 2013. Chain store growth is slowing around the Big Apple, except in Brooklyn and Staten Island. The number of New York City chain retail store locations increased only 0.5 percent from 2012 to 2013, the smallest year-over-year increase citywide since 2008. Retail property sales hit $445 million in the third quarter. Growing confidence among national, international and local buyers increased the numbers. A recent repeal of the so-called 80-20 rule, which capped residential co-ops buildings’ gross income from ground-floor retail at 20 percent, also gave the market an increase in supply.